We are able to take our powerful faith into service of humanity to help others make the journey themselves form darkness into light. Personal love can be raised to a higher level as we radiate our light not just to close loved ones but to all and everyone. It is only through the surrender of self-importance that we can truly realize the importance of self. A mystery reveals itself to us as we serve others – the hidden truth of who we are, and what really matters to us. Even when we don’t feel the urge to serve, it may be helpful to act as though we are quite humanitarian. This is provided we guard against the risk that such a superficial approach may hinder our grasping the deeper meaning in service. Certainly this often enhances our social reputation, and tends to lead us to a more subtle realization of the value of renunciation. Yet truly, for its own sake, the loving heart seeks opportunities to care for others with a steady, constant concern; rewards and success are secondary issues. The benefits are long-term and sometimes rather imperceptible, so we also need trust. Basically, there is no greater path of self-realization than to help others, even when this is at our own personal expense of effort and emotional bruising. By doing so, we affirm our own maturity since it is more child-like to need support and more parent-like to give it. This affirmation is itself a force that propels us towards greater wisdom and emotional balance. 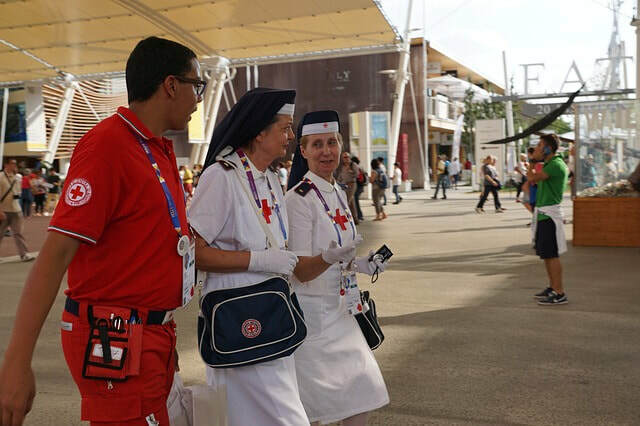 A Red Cross nurse is just one example of a person who has enlisted to dedicate themselves in a committed way to a worthwhile, enduring project. There are many equivalent paths available, one of which will certainly offer challenges and demands that are appropriate to our particular skills and resources. It is entirely consistent with the essential qualities of being human that we will look for an ideal occupation in order to ground our spiritual principles. The philosophy of spiritual wisdom is of no consequence if it lacks application, so we must seek to create a life that demonstrates in real terms what we believe in and hold to be of lasting importance. Thus we renew daily our ability to put aside our need for ego-recognition – and by doing so we may start to feel a dissolving of our sense of separateness. When my-self is surrendered, there may even be occasions when the mystical awareness of all-self is glimpsed.